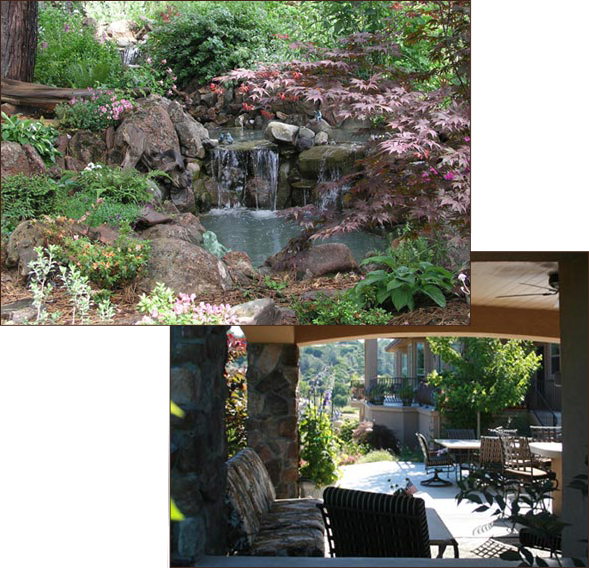 I have been working closely with friends and clients to site plan and design beautiful custom gardens and waterfalls in the foothills communities since 1977. After receiving my degree in landscape architecture, I interned and mentored under the distinguished Garett Carlson in Beverly Hills throughout the 1980s. Returning to the Auburn area in 1991, I have been creating magical and smooth-flowing gardens designed in harmony with the spacious and scenic backdrop of the varied environments in the Sierra Foothills. The following pages will introduce you to some of those gardens and my design concept. The before-and-after pictures give you a sense of adaptability to varied landscaping challenges. The waterfall page shows a variety of soothing, falling water that appears to be emitting from an unknown natural source. The outdoor living page gives you insights into living spaces as an inviting and relaxing garden element. Enjoy your walk through them, and please feel free to email me in Applegate, California, with any comments or questions. Trust in me to bring your landscape ideas to fruition.